← Champagne: time for the bubble to burst? There is a merchant who keeps sending me brochures, but whose wines I simply cannot buy. It’s not that they are worse than everybody else’s – after all, I don’t know – it’s just that I can’t stand the way they describe them. Too many exclamation marks. Too many over-effusive descriptions. Reading their brochures is like walking through an east end market, being assaulted by over-the-top sales patters from tradesmen all the way. In the end, you just ignore the lot of them, and go somewhere quieter to do your shopping instead. “Lavish, barrel-aged Shiraz – from one of Oz’s most exciting young winemakers!” they cry. “Be quick to savour a gloriously mature 2002 Australian Cabernet from a 5-star winery!” they shriek. “The Gold-medal winning triumph returns, richer and smoother than ever before!” they yell. “Powerfully deep and as popular as ever, keep your glass full to the brim with El Bombero!” they squawk. And then they add something about how not only do you simply have to buy this wine, but you have to do it RIGHT NOW! “Cellardoor-priced Aussie marvel and a must for red wine lovers – act now for this amazing one-off!” they yelp. “Rich, dark and thoroughly satisfying. Don’t miss this treat from one of Portugal’s finest!” they bellow. “Seductive and elegant arrival from one of Central Otago’s best – secure your share today!” they whoop. Then there are the constantly pushed case “deals”: more of the same, only with more exclamation marks than usual. As much as anything, I detest being sent an apparently generous £50 voucher only to discover that it is redeemable against only one, pre-selected mixed case, composed entirely of basically the same red wine only with different labels on. I reckon I could spot the average Laithwaites description at 50 paces – they bring me out in spots and induce a chronic case of the shakes. I am Laithwaitesdescriptionphobic. So here’s a little test, for interest’s sake. 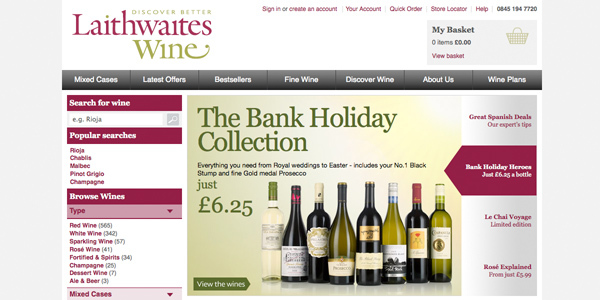 How clear a style do Britain’s major wine retailers have when they describe a wine? There aren’t many wines that are available in every single major retailer, but Bollinger’s Grand Cuvée is one. Can you tell which retailer is responsible for which description? Can you spot the patter pattern? Click here for the Cellar Fella sales patter test! This entry was posted in Uncategorized and tagged bollinger, descriptions, laithwaites, selling, special cuvee, wine. Bookmark the permalink. Good post – I agree – and I love the quiz. But best not to cheat with google, I reckon. That would be like moving the ball in the rough with your shoe. As the quiz is just for fun, and nobody else will ever know the result, and it’s only a ruddy guessing game anyway, cheating with google would, I believe, reflect pretty badly. Your conscience might never recover. I think you can’t help but admire theire machine like methods of wearing customers down into repeat orders. They are essentially a supermarket in as much that they don’t sell wine rather they sell deals, something I hate too. You have us bang to rights there, fella. Our way of writing has certainly got out of hand. Mea Culpa probably. I’ve been criticised for decades about overuse of exclamation marks. It was what I was once taught. Maybe I’m addicted. But everything has changed and clearly we are going to have to change our ways. The first thing Justin H-S – our new Buying Director said on arrival was; “Do you have to rave on so about every single wine”? I agreed he had a point but that saying “This wine is only quite good” was not going to do much for its sales. There is an answer however. Our Buyers know all the specific reasons why they have bought each wine. But they don’t write to the customers. If we can get better at getting their voice and some hard facts through to the customers we can write at a more normal decibel level and won’t have to resort to screaming. We know there’s a problem. I’m sure you’ll let us know if we manage to solve it. Then we will be Fantastic!!!! Damn, there I go again.